In most cases computer users need an external drive to “back up” documents, photos, holiday videos and other information in case computer die. Let’s try to compile the best external hard drive brands. Buffalo Technology is known for its durability, shock protection, and thick plastic casing. This company makes some of the best external drives on the market. So if you’re looking for an efficient hard drive that can survive a fall and go to work with you, BT has what you need. Transcend’s StoreJet is very durable, has up to 1TB capacity and it has the transfer speed of 5 Gbps. 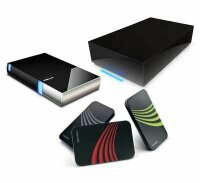 While Transscend has a wide selection of portable hard drives, they do NOT sell desktop hard drives. The most popular is the Backup Plus Portable Hard Drive. It comes with features such as “social” backup for all your facebook, additionaly this hard drive “shares” its contents with a simple click. Seagate has reliable products, and pretty awesome features, but it is pricy. My Passport Essential has the best reviews which is no wonder; it’s small, portable, and holds up to 2 TB of memory. ioSafe designed their external hard drives to take the worst natural disasters. You can screw it down to thief-proof it. It is both fire and waterproof and you can screw it down to thief-proof it. It can take temperatures up to 1550 degrees for an half-hour, and it can keep your data safe even beneath 10 ft of water for 3 days. Their data recovery service will cover any other digital disaster! « How To Back Up Your Data? I like the helpful info you supply on your articles and will bookmark your weblog and check again here frequently. I am fairly certain I’ll be informed many new stuff right right here! Good luck for the next!